The Impulse products use conventional momentary switches to provide switched or dimming operation of a lighting circuit. ON/OFF and Dimming up/down control is possible through a single momentary switch or centre retractive switch. This allows simple, yet elegant operation of lighting loads without having to use rotary or slider controls and by using momentary switches, multi-position switching is also simplified. Residential applications for Impulse dimmers include living rooms, kitchens, bedrooms and bathrooms, while commercial applications range from hotel bedrooms and meeting rooms to treatment rooms and karaoke music pods. Impulse is also popular for projects which require a higher load capacity than conventional dimmers can reliably achieve. Where rotary, slider or scene setting control is not desired, Impulse allows designers to select push button plates from any manufacturer allowing a continuity of style from the electrical sockets to the light switches, a design choice usually only afforded on larger projects.Impulse can operate in two formats. Using a single momentary switch the control cycles between ON and OFF when pressed and dimming up and down when the switch is held. Centre retractive rocker switches can also be used which have two momentary contacts (up and down). 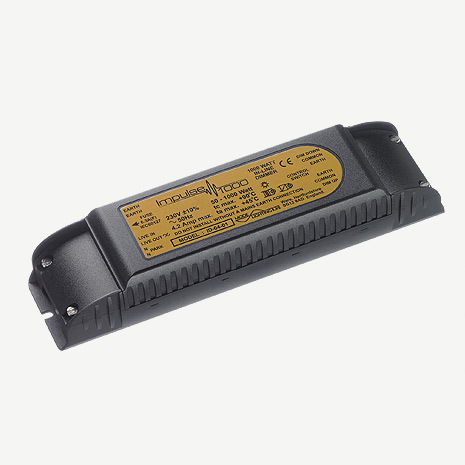 These provide ON or dim up and OFF or dim down control of the lighting. Both types of control provide simple intuitive operation of the lighting in a room, which is especially suited to applications where different people may use the room on a regular basis.Impulse is available in 500w and 1000w ratings for mains dimming and a 1000w switching unit with 1-10V output for fluorescent control or for linking to our range of slave power units for much higher load handling.